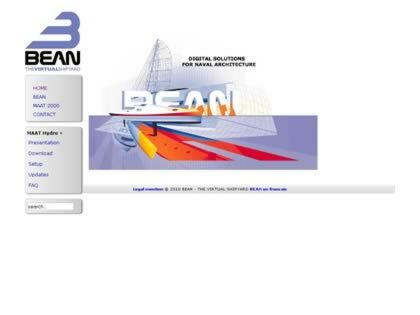 BEAN was founded by Erwan Quémar and Manuel Guédon in response to the increasing demand for 3D modelling in Naval Architecture design and shipbuilding. BEAN works on all type of boats, focusing on modelling hulls, superstructures, structures, hydrostatics, stability, etc… BEAN’s major tool is Maat software and a combined 15 years experience on said software. Web Site Snapshot: If available, above is a snapshot of the BEAN web site at http://www.thevirtualshipyard.com as it appeared when this site was added to the directory or last verified. Please Note that Boat Design Net has no involvement with the above web site; all content and images depicted in the above thumbnail are the property and copyright of BEAN unless otherwise noted on that site. Description: BEAN was founded by Erwan Quémar and Manuel Guédon in response to the increasing demand for 3D modelling in Naval Architecture design and shipbuilding. BEAN works on all type of boats, focusing on modelling hulls, superstructures, structures, hydrostatics, stability, etc… BEAN’s major tool is Maat software and a combined 15 years experience on said software.